Welcome to the 2019 ACTJRU and MRC season. Welcome to new players and welcome back to those boys returning to the sport in 2019. All new (first season registered) players will receive a free playing jersey. These are available from the College Uniform shop. This includes any new players in 2018 as the boys received the 2018 50th anniversary jersey to play in 2018 only. Please keep an eye on the 'Latest Info' page for the most up to date news etc. The draft Rugby schedule and pre-season training ground allocation schedule are now there to view. If you have any concerns throughout the season please raise with your team coach/managers or contact us via email. I'm looking forward to another great season and watching our boys enjoy the challenges of playing Rugby. For all the latest information click here. 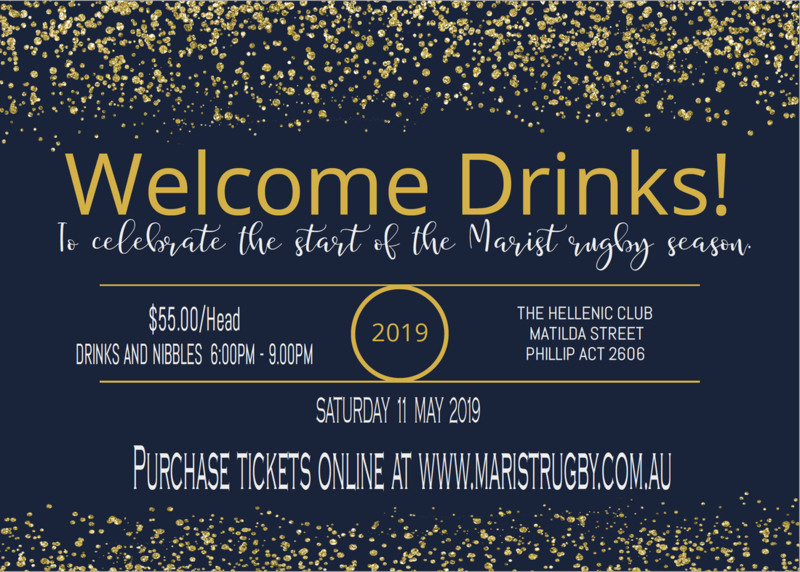 2018 celebrated 50 years of Marist College Canberra and 50 years of Marist Rugby. The success of the club in 2018 is a direct reflection on the passion for Rugby that exists in the boys who played this year, the support they received from their teacher and parent coaches and manages and; the guidance, management and direction provided by the Marist Rugby committee. The main achievements this year have included the 50th Anniversary jersey worn by all boys this year. It looked outstanding and the jerseys will be cherished by the boys into the future. The Senior boys toured New Zealand and were able to do so with the generosity of financial sponsorship sourced by Marist Rugby. The pre-season games conducted at St Gregory’s – Campbelltown and St Josephs - Hunters Hill were assisted with coach transport, and the U15 boys competed in the Gold Coast Rugby tournament. Particular thanks go to the teachers that organised these school activities, Paul Mead for the pre-season games, Tom VanderWaterbeemd for the New Zealand tour and Tony Sullivan and Luke Croker for the Gold Coast tournament. The experiences support rugby development and are deserving of support, where possible in the future. The Club was able to award a Life Membership this year. Life membership of the Marist Rugby Club is awarded for outstanding service to Marist Rugby over an extended period of time. These awards are presented only where they are clearly deserved and therefore not necessarily awarded every year. The life membership was awarded to Mr Tony Sullivan at the presentation evening. Tony has been involved with Marist Rugby for the last 23 years through coaching a number of different age groups and in more recent years ‘specialising’ in the U15s. Tony has developed a great relationship with the boys and teams he has coached and his commitment to Rugby and ability to instil Marist values and the Rugby principles into the boys he has coached is outstanding. 6 out of the 18 teams were minor premiers finishing in No 1 position in their competition. 17 out of the 18 teams made it to the semi-finals. 10 out of the 18 teams made it to the grand-final. 8 out of the 18 teams were premiers winning their grand-final. Congratulations to these teams that included the 1st and 2nd XV, U15 Royals, U11 Royal and U11 Sky and U10 Royal, U10 Sky and U10 Blue. The activities of the club would not be possible without sponsors including the Hellenic Club, Civium Property Group, Tiffen and Co, Podiatry Professionals, JV Business Insurance, Barton Molloy Property, National Capital Glass, Gillespie Group and Alliance ICT. This sponsorship allowed us to provide every boy with the 50th Anniversary Jersey, we also supported the Senior Rugby tour to New Zealand, the U15 participation in the Gold Coast Rugby tournament, the Strength and Conditioning program as well as playing equipment, transport, coach and first aid development. The Marist Rugby model, of teaching staff enmeshed with parent volunteers gave us 38 registered volunteers who filled regular roles throughout the season plus hundreds more that assisted on game days, setting up and packing up fields, running side lines, providing oranges and lollies for half time and after games, photographers, report writers, working on the BBQ and in the canteen, selling merchandise, coaching, managing, providing first aid and marshalling and refereeing. Thank you to all the volunteers, helpers and parents, it is because of these people the boys were able to enjoy a great season. And lastly thank you to the players. Rugby is a physically and mentally demanding game, it will only help the boys to grow and develop. I hope every boy enjoyed the season, the challenges it has brought them, and I hope that you can reflect and grow from these experiences. We love to hear from you with all feedback, suggestions and ideas. Please email the President, Webmaster or Secretary at anytime.